* First, to honor and imitate the ineffable dependence that God the Son was pleased to have on Mary, for His Father’s glory and our salvation. This dependence appears in a particular way in this mystery, where Our Lord Jesus Christ is a captive and a slave in the bosom of the Most Holy Virgin, and depends on her for all things. * Second, to thank God for the incomparable graces He has given Mary, and particularly for having chosen her to be His most worthy Mother, the choice which was made in this mystery.” (True Devotion to Mary, Montfort Publications, 1975, p. 165). The two texts here are co-related. First, St. Louis Grignion de Montfort affirms that the mystery of the Incarnation is par excellence the one to which the true slaves of Our Lady should have devotion. Second, he maintains that the mystery of the secret life of Jesus in Mary is a mystery that contains all the others, that it was the point of departure for all the wonders of His life. Let us analyze the first part and then the second. The Treatise of True Devotion to Our Lady is, in my opinion, a prophetic book with regard to what it states about the mysteries and devotion to Our Lady. One sees that the profound things St. Louis de Montfort says will be revealed as theology develops in the Reign of Mary. Today the meaning of his words cannot be fully comprehended. For example, who can entirely understand his affirmation that Our Lord was the slave of Our Lady during the time He lived in her? After the Annunciation and the fiat of Our Lady, Our Lord was made flesh in her bosom. From that moment, He had a perfect knowledge of everything. He was cloistered inside her, living in exclusive contact with her, in a complete dependence on her, the most complete dependence a person can have upon another. The Word Incarnate, completely lucid from the first moment of His being, chose to live this life inside another creature. It was by His design He lived inside that temple, that palace, in a mysterious relationship with Our Lady. God manifested His omnipotence in the Incarnation. He also manifested His power by maintaining Our Lady a Virgin before, during, and after the parturition. Everything about the Incarnation is so extraordinary that He could have arranged for Our Lord to be born just a short time after the conception. But He did not do this. He chose to live the full nine months in her. He wanted to establish that special form of dependence upon her. He chose to have that profound and mysterious relationship of soul with her. In short, He wanted to be her slave - but a special kind of slave - because the normal slave has his own life, he breathes on his own, he has freedom of movement. What He wanted was more than this; He wanted to depend entirely on Our Lady. What kind of relationship of souls was established during this period? What type of union took place? It is an impenetrable matter. But just to have a certain reference point, we should consider that in the mystery of the Incarnation, Our Lord assumed a human nature - that is, in addition to being true God, He also became true Man. He had soul and a body, as we do. Like us, He was a descendent of Adam and Eve. But parallel to this, His human soul had - and has – a union with God so close that Jesus Christ is part of the Holy Trinity. In Jesus Christ there are not two persons; there is only one Person, even though the human soul of Christ was created. How can a human soul constitute one person with God? It is a mystery. Theology teaches us that this is a hypostatic union, but it does not explain the mystery. Considering His divine and human natures, how can one explain why Our Lord cried out on the Cross, “My God, My God, why hast Thou abandoned Me?” At that moment, He continued to be God, but He chose to suffer in His humanity a kind of abandonment and isolation that made Him feel in His human nature a complete abandonment, even though He remained united with God in His Divinity. Again, we have a mystery. The union of Our Lord with Our Lady when He was in her womb is less than, but similar to His hypostatic union. It is entirely incomprehensible, but a day will come when light will fall on it for mankind. I believe that in the Reign of Mary a theological explanation will be made for the greater glory of God and the good of souls. There are still many unexplained mystical points regarding the union that Our Lady has with each one of her slaves, which is incomparably less than the divine mystery of her union with Our Lord. All these mysteries follow the same line, but we do not know how to explain them. What we can see, however, is that these mysteries take a direction diametrically opposed to the Revolution in two of its principal doctrines: Pantheism and Individualism. According to Pantheism, everything is god; one thing has no essential distinction from another. Every creature is united with every other, all making just one single person. Individualism asserts that each one is himself alone and does not need to be united with anyone else. The Catholic position opposes both errors. It affirms that each person is himself alone, an individual, but open to relationships with others that will serve to greatly enhance his person. The deep explanation of how this occurs, however, is another mystery that I hope theology and philosophy will explain in the Reign of Mary. Once I read in a book of revelations – I don’t remember if the author was a pious person or a saint – affirming that when the relationship of Our Lord living in Our Lady will be explained, the key to understanding the Apocalypse will be found. Then, a new theological dawn will shine on the world, which will illuminate and expand the former theological horizons. I believe that we should hope and pray that these linked mysteries will one day be disclosed. St. Louis de Montfort maintains that the mystery of the Incarnation contains all the others. We know that on each feast day the Church gives us special graces related to it. 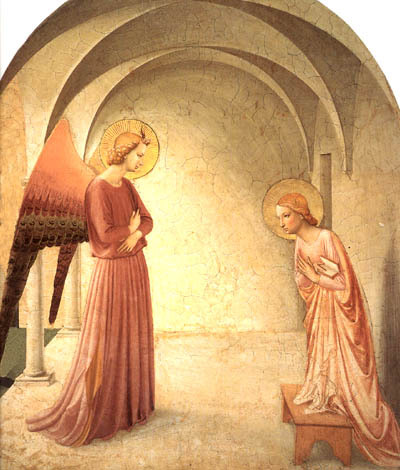 Therefore, on the day of the Annunciation of the Angel and the Incarnation of the Word, these linked mysteries impart a special fragrance related to the first mysterious union between Our Lord and Our Lady. We should recommend ourselves very much to Our Lady on this feast day and ask her to initiate with us a relationship of soul of Mistress and slave. We should ask her to make us her humble subjects, like the Child Jesus when He was living within her.